The numbers are truly astounding. The Land Matrix Partnership estimates that over 200 million hectares of land were sold, leased, licensed or put under negotiation between 2000 and 2010. This is eight times the size of the UK. Critics have dubbed this the ‘global land grab’ and identified three characteristic trends: (1) the emergence of new types of investors, like sovereign wealth and pension funds; (2) increasingly large-scale and long-term land acquisitions; and (3) changes in land-use toward monoculture farming for ‘fungible crops’ used as biofuels, animal feeds and processed foods. 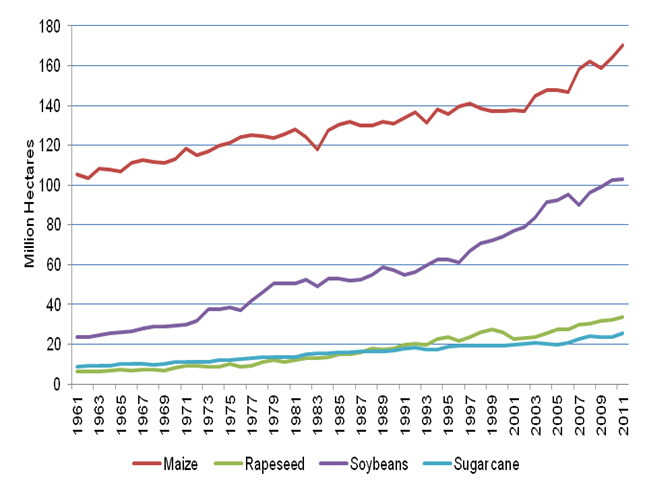 Source: Data from FAOSTAT. Graph: author’s own. Based primarily in the Global South, this process has had a profound impact on the world’s poor. Combinations of force and fraud have been used to move peasants, pastoralists and forest-dwellers off the land, while the prospects for re-employment on capital-intensive plantations have been grim. The livelihoods and identities of millions of rural people have been put at risk, if not already shattered. Surprisingly, contemporary IPE has largely ignored land control, habitation and the production of nature by capitalism (see Prudham and Heynen’s lament to this effect in the pages of New Political Economy). It is surprising precisely because of the field’s disciplinary antecedents. In Marx’s Capital we read of the historical expropriation of the agricultural population in England, a process by which the soil was made ‘part and parcel of capital’ and a proletariat produced for the town industries. This primitive accumulation also rendered the rural economy peripheral, transforming it into a dependent supplier of raw material for the hungry metropolitan factories. From Polanyi’s Great Transformation we learn more about the consequences of annexing the countryside to the city mill through the commodification of land. Polanyi shows that rental markets did not arise naturally, but were forcibly created and actively managed through new legislation and the watchful eye of local administrators. One consequence was that the apparatus of the state was extended twice over. Polanyi also argued that dis-embedding – or, more aptly here, uprooting – the economy in this way robbed rural dwellers of their ‘self-respect and standards’ and nature of its ‘protective covering of cultural institutions’. We learn more of the ideology that facilitated this rupture with the soil in E. F. Schumacher’s Small is Beautiful. It was the ‘townsman’s determination to apply to agriculture the principles of industry’ meaning the ruthless pursuit of output, combined with the rejection of noblesse oblige or what we refer to nowadays as stewardship. Within such a stark worldview, the living world had ‘no significance beyond that of a quarry for exploitation’ and the higher motivations of the ‘health, beauty and permanence’ of nature were estranged from public policy. As Schumacher pointed out, the only remaining reason to preserve the aesthetic form of land was to maintain the monetary value of tourist destinations and country homes – ironically, the very kind of rural retreats sought by townsmen who now wanted refuge from their industrial environment. Taking biophysical land seriously is, then, actually within the very lifeblood of IPE. In renewing this acquaintance the discipline can play an important role in unravelling (and potentially checking?) the global land grab. Existing research, largely from the field of agrarian studies, has addressed the ways in which land deals are being legitimated through new institutional arrangements and economic narratives. We are told, for example, that land in Africa is ‘idle’ and must be converted to commercial farmland to ‘feed the nine billion’. What IPE can do is help anchor these accounts more firmly in the dynamics of capital accumulation, particularly as they relate to ‘financialisation’. Jason Moore has asserted that ‘Wall Street is a way of organising nature’, for which we need look no further for evidence than the impact of financial assets linked to agricultural commodities on the world prices of food and demand for farmland (see Clapp and Helleiner’s paper ‘Troubled Futures’). Yet there are many more links between finance and land that need exploring as we can see in the three examples below. In the UK, prices for farmland have tripled in the last decade, outpacing even those of residential property now re-inflating after the housing crash. This is partly because of rising food prices and state-subsidised biofuel production, but also because of regulations reducing the tax burden of farmland. The creation of these ‘onshore tax havens’ has not only allowed the rich to escape claims on their wealth by avoiding inheritance tax, but also priced out would-be farmers from food production, in particular those wishing to practise less industrialised forms of agriculture. In China, the regime of state capitalism has seen the gains from land sales flow into the hands of local government officials, who stand accused of a ‘great land swindle’ by manipulating the value of land acquired from peasants and sold to property developers. At the same time as the Communist party has tolerated this capitalist privatisation at home, it has advanced a kind of statist privatisation abroad, directly acquiring foreign land in order to bypass global commodity traders and secure supplies of food and feed. Finally, in Indonesia, we can tie together the rhythms of environmental destruction with credit creation. Fuelled by cheap money, in the 1990s one of Asia’s biggest pulp and paper companies, APP, began a major expansion of milling capacity and forestry concessions, attracting criticism from campaigners wanting to protect the region’s biodiversity. When the Asian financial crisis hit, the company’s owners defaulted on over US$13bn of debt. Yet the problem did not end there. Despite a huge debt restructuring, significant debt repayments remained. Arguably, this hindered investment in more sustainable forms of forestry and led to a continued reliance on wood harvested from natural forest. So what’s the core message? To recover Schumacher’s ‘higher motivations’ in our relationship with land, we need first to understand the ‘base motivations’ of those buying it up.